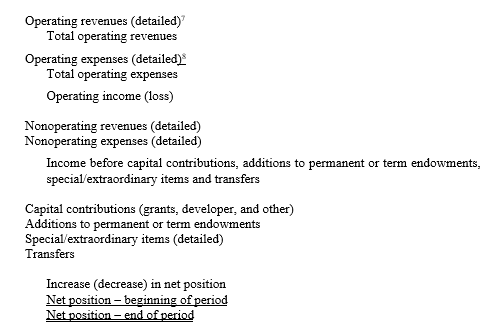 Statement of cash flows (see Statement of Cash Flows). Proprietary funds are presented using the economic resources measurement focus and the full accrual basis of accounting. They are reported the same way as in the government-wide financial statements. 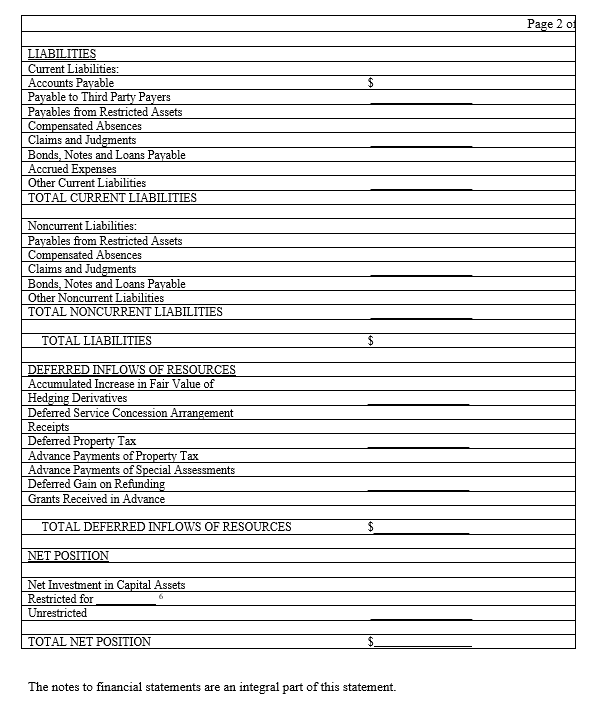 However, internal service funds should be reported as a fund type (aggregated) in a separate column. Major enterprise funds are reported in separate columns and nonmajor enterprise funds are aggregated in a single column. A combined total column for all enterprise funds should be presented. 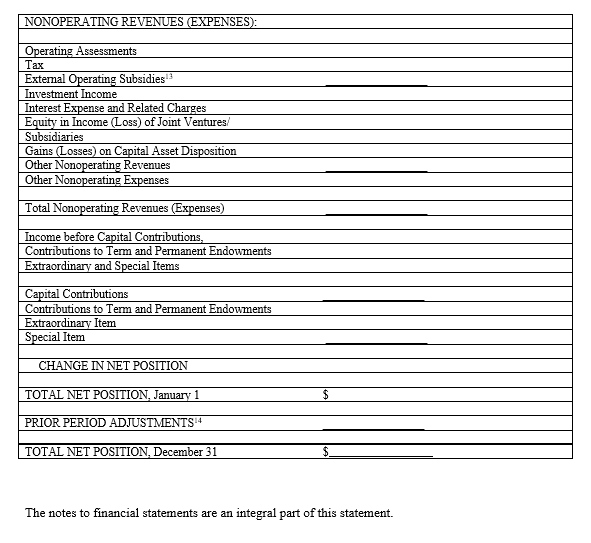 By reporting the internal service funds separately from the proprietary funds, the information in the Totals column in these statements flows directly to the Business-Type Activities column on the government-wide statement of net position. The interfund eliminations within enterprise funds are not required. Assets plus deferred outflows of resources equals liabilities plus deferred inflows of resources plus net position. 4.3.4.30 Assets and liabilities should be presented in a classified format. 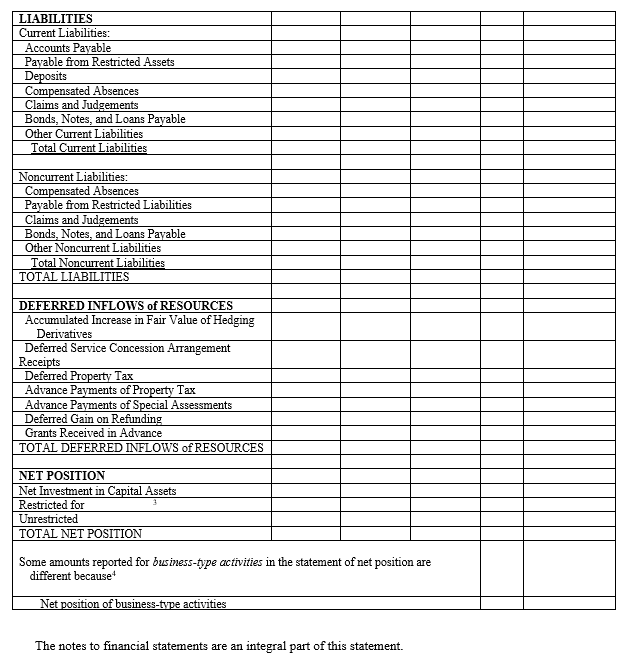 This requires reporting assets and liabilities as either current or noncurrent. A one-year cut-off is typical when determining if assets are expected to be realized in cash or consumed and liabilities are expected to be paid. Current assets include: cash available from current operations, receivables, inventories, prepaid expenses, and investments, etc. Current liabilities include accounts payable, notes payable, amounts due to other funds, current portion of long-term debt, current portion of compensated absences, claims, and judgments, etc. 4.3.4.40 Any asset that normally would be available for use in operations but which use is restricted by externally enforceable constrains should be reported as restricted assets. Examples: cash held by a trustee in escrow for future debt service payments, assets that are restricted for the acquisition or construction of noncurrent assets, etc. 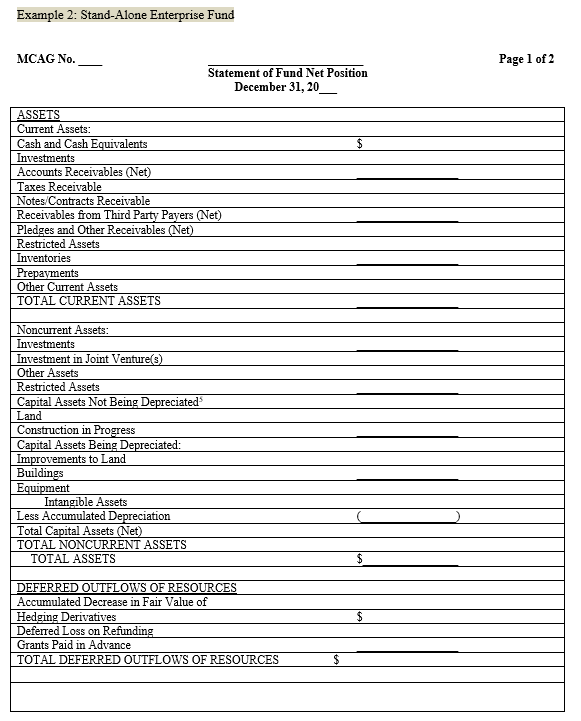 Most of the restricted assets are noncurrent. However, restricted assets that will be used in current operations (e.g., certain grants, etc.) should be reported as current assets. Liabilities payable from restricted assets should be reported separately as current or noncurrent. 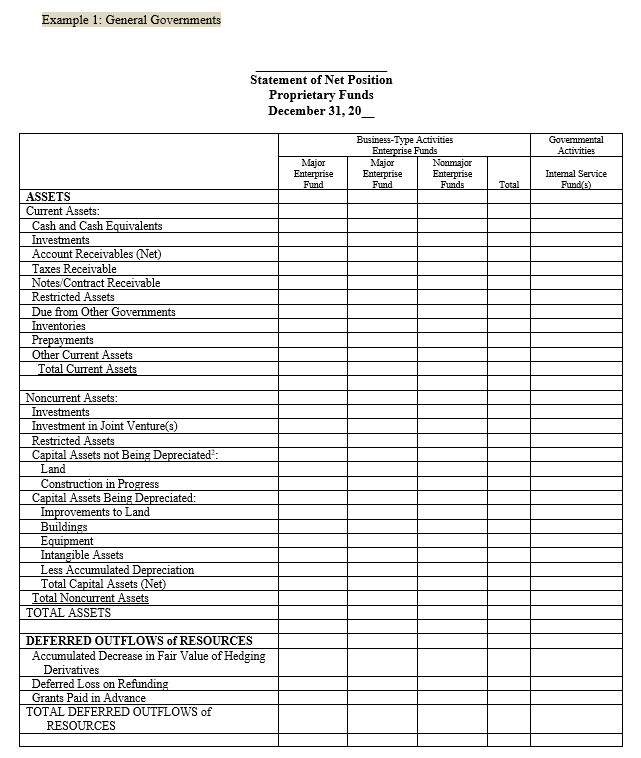 In this presentation all activities are combined into one column. In this option each activity should be reported separately. All duplicating transactions should be eliminated. The elimination may be presented in a separate column on the face of the financial statements or in the notes. The government must also present a total column for all underlying activities. For classification of the net position refer to the Net Position. 4.3.4.70 The account titles shown on the statement are for references and are sufficient for most local governments operations. The line items presented are an example and may need to be customized. The accounts listed are deemed to be at the appropriate level of detail for most reporting local governments’ activities. Before deleting any lines make sure the local government does not have activity in that area. In some instances additional accounts may be required. Adjust the statement appropriately. 4.3.4.80 If amounts reported for enterprise funds differ  from those reported on government-wide financial statements in the business-type activities column, the government should present a summary reconciliation on the bottom of the proprietary funds statement of net position. 4.3.4.81 Additional instructions for the public entities risk pools are provided here. 4.3.4.82 Additional instructions for the housing authorities are provided here. This is an all-inclusive format. All transactions (including capital contributions) that affect net position should be included. No amounts may be reported as direct addition to net position. All transactions, including capital contributions , additions to permanent funds, equity transactions involving joint ventures have to be reported in the statement of changes. In this presentation all activities are combined in one column. In this option each activity should be reported separately. All duplicating transactions should be eliminated. The elimination may be presented in a separate column on the face of the financial statements or in the notes. The governments must also present a total column for all underlying activities. Elimination is also done to minimize the grossing up effect on assets (receivables) and liabilities (payables) on the statement of net position. 4.3.4.110 Revenues should be reported by major source. All revenues should be reported net of discounts and allowances (they should be disclosed in parenthesis or in the notes to the financial statements). Uncollectible amounts should not be reported as expense but as adjustments to revenue. 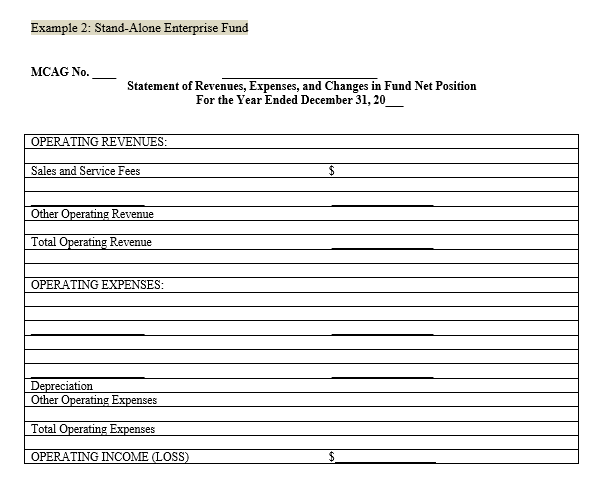 4.3.4.120 Revenues and expenses should distinguish between operating and nonoperating. Governments should establish their own policy for defining operating and nonoperating revenues and expenses and the policy should be disclosed in the notes to the financial statements. Operating revenues and expenses should be directly related to the primary function of the entity. It is the source of revenue not its purpose that defines the revenue as operating in the statement of changes. Operating grants and contributions and grants and contributions that are not restricted to either operating or capital functions. Exchange-like transactions which are restricted for capital or financing purposes. Interest and dividends and realized and unrealized gains or losses on investments. Interest expense, debt issue expenses, and premium or discount on debt. 4.3.4.140 The government should present a summary reconciliation on the bottom of the statement of changes if the amounts reported for enterprise funds differ from those reported on government-wide financial statements in the business-type activities column. For more details see Conversion and Reconciliation between Government-Wide and Fund Financial Statements. 4.3.4.150 The following forms do not contain provisions for component units. If the government has a component unit as defined by GASB Statement 14, make the appropriate modifications to its statement. The Manual discusses the reporting entity and potential component units in GAAP Reporting Requirements and provides examples of financial statements which include component units. For further information, refer to the Manual and GASB Statement 34, paragraph 126. 4.3.4.160 Additional instructions for the public entities risk pools are provided here. 4.3.4.170 Additional instructions for the housing authorities are provided here. The difference may be due to the internal service funds, which can be included in the business-type of activities in the government-wide statement of net position. When detailed information regarding capital assets is provided in the notes, the government can use here one line for presentation of capital assets. However, if the government has a significant amount of nondepreciable capital assets, they have to be presented separately from depreciable ones on the face of financial statements, regardless of level of details in the notes. When permanent endowments are included, restricted component of net position should be displayed in two additional components: expendable and nonexpendable. For more details see Conversion and Reconciliation between Government-Wide and Fund Financial Statements. Examples: power, water sales (PUDs); patient revenue (hospitals); airport, marina, marina terminal charges (ports); passenger or special fares (transits); member assessments/contributions, supplemental assessments, application fees (risk pools); tenants revenues (housing authorities). Capital contribution include revenues received in the form of contributed capital assets, nonexchange grants and contributions restricted to capital purposes, fees and charges restricted to capital assets acquisition. This presentation requires additional audit procedures due to the multiple opinion units and it may result in an increased audit time. As updated by GASB Statement 30, Determining Whether Certain Organizations are Component Units. 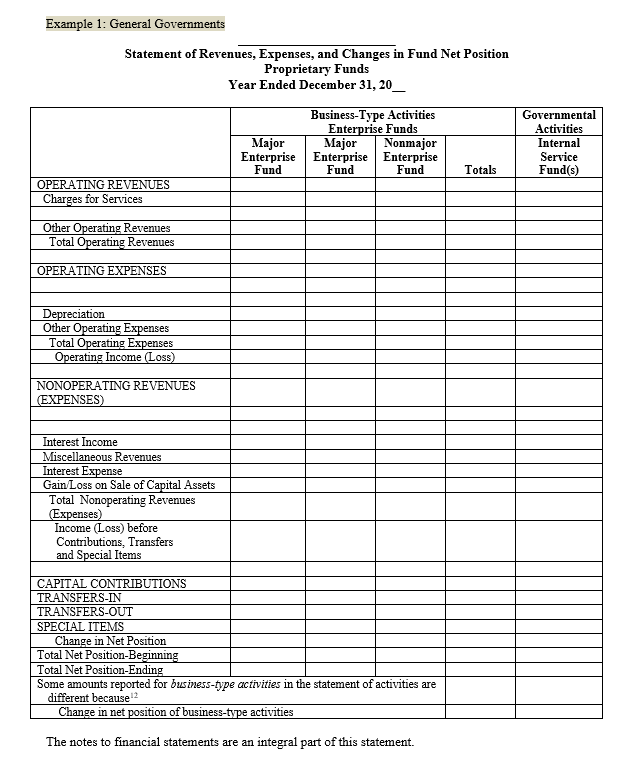 If operating grants and subsidies are shown as operating revenues (optional presentation) note disclosure is required in the summary of significant accounting policies. Note disclosure needs to be given for a prior period adjustment. Direct adjustments to net position should be limited to corrections of errors and changes in accounting principles.